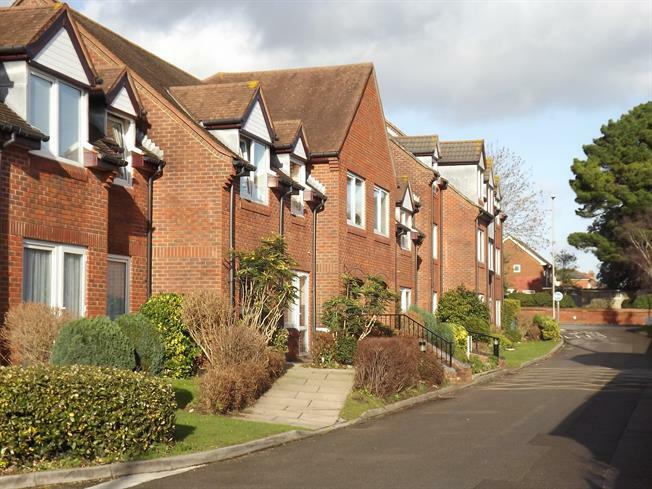 2 Bedroom Flat For Sale in Christchurch for Asking Price £160,000. A first floor flat designed for the over 60's (partner can be 55 or over) with house manager and built in 24 hour care line and offering light and airy accommodation including an entrance hall, lounge/diner, modern kitchen, two double bedrooms, both with built in wardrobe cupboards, useful walk in store cupboard, modern shower room, night storage heating, fitted carpets and blinds, visitor and residents parking, private communal gardens, guest suite, residents' lounge and laundry room. Front door with spy-hole leading to entrance hall. Night-storage heater. Useful coats storage cupboard with hanging rail and shelf. Tiling to walls with decorative reliefs. Single-bowl-and-drainer stainless steel sink with mixer tap. Roll-edged work surfaces. Range of modern cupboards and drawers. Space for cooker. 'Adell' extractor fan. Double-glazed window. Built-in wardrobes. Night-storage heater. Wall-light point. Telephone point. Double-glazed window. Electric storage heater. Built-in wardrobe. Wall-light point. Double-glazed window. Tiled wall with decorative reliefs. Large fitted shower cubicle with sliding doors. White W.C. and wash-hand basin. Mirror and light over. Extractor fan.